From the beginning of her fast on Dec. 11, Attawapiskat Chief Theresa Spence has not been alone in forgoing food as she waits for Prime Minister Stephan Harper and Governor General David Johnston to agree to a meeting. Lorraine Iahtail of Attawapiskat, Joseph Jean Sock of Elsipogtog, N.B., and Raymond Robinson of Cross Lake, Man., have all at some point joined Spence on Victoria Island to support her in what Spence calls a sacred fast. Iahtail was already living in Ottawa after moving from Attawapiskat to start a new life. When a friend mentioned Spence’s fast, Iahtail sought her first at Parliament Hill before finding her on Victoria Island. Though the 36-year-old did not know Spence that well on a personal level, she felt she should support her. “I told my friend I might fast with her, and when I got here, I said I’m gonna do it,” Iahtail said. 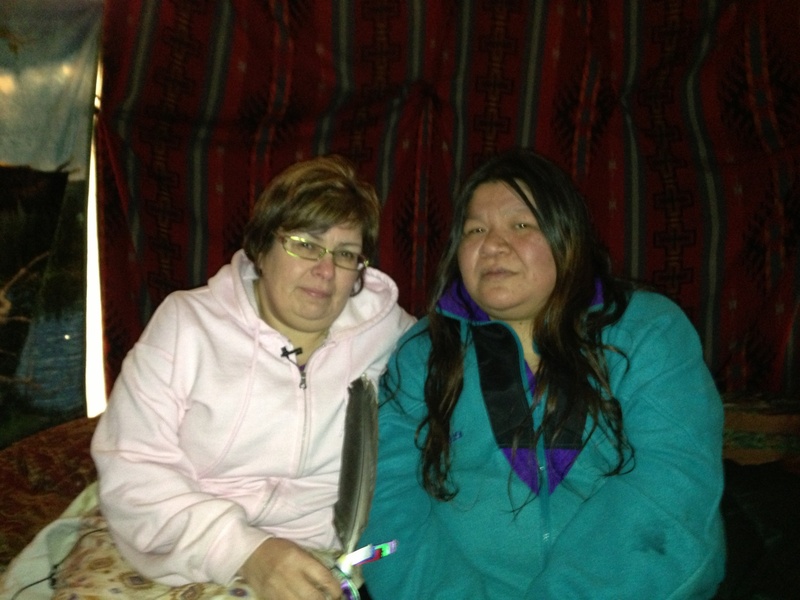 Iahtail began fasting with Spence from the day it began and stayed with her in the teepee. She felt that by being with her, it gave Spence strength. “You need a workout partner to keep going and that’s the way I thought about it,” she said with a laugh. Sock was living in his hometown when he had a vision but could not comprehend what it was about. Then he heard about Spence and tried to gain the support of his band council to send him to Ottawa. The council members initially called Sock “crazy” for wanting to go to Ottawa, but once they learned more about the cause Spence was fasting for, they agreed to send him to Victoria Island. The M’kmaq sundance warrior stopped eating once he arrived at the camp on Day 7 (Dec. 17) of Spence’s fast. As Spence was contemplating going on her fast, Robinson was having similar thoughts in his home of Cross Lake. Robinson, a Cree Elder and pipe carrier, was concerned the bills being passed in the House of Commons would affect his and the future generations’ way of life. Robinson had attended and survived three residential schools in his youth. When Harper made the apology in 2008, Robinson, who had worked as a health support worker for a residential school survivor organization, said he forgave the federal government for what it did to him and his people. So Robinson began to think of a way to protest the bills. Robinson said he originally was going to start his fast the day Spence started hers, but held off to consult with Elders and council members. He began his fast 10 hours after Spence began hers. He stayed in his home in Cross Lake but began to get in touch with Spence in Ottawa. Robinson arrived on Victoria Island on Dec. 31, 20 days into the fast. Iahtail said though it was tough to get past those first few days without eating, she enjoyed her time with Spence. But as the fast progressed, Iahtail said she became weaker. Following the Idle No More rally to Parliament Hill on Dec. 21, hundreds of visitors converged on Victoria Island to see Spence. Iahtail remained in the teepee with her as she received visitors. Sock is amazed by all the people that come to Victoria Island. “I’m very proud to be here, to see the things that you normally wouldn’t see,” he said. Unfortunately, Iahtail, who is diabetic, had to end her fast for health reasons. She continues to visit Spence and her family on a regular basis. Sock ended his fast after 28 days to be with his ailing mother. Robinson continues to stay on Victoria Island with Spence, and recently joined her in a TV interview.